This week’s instalment of the #SBIDinspire features the remarkable design of the Cumberland Art Gallery Suite located within the grandeur of Hampton Court Palace. The Cumberland Art Gallery is a dedicated space that allows visitors to view artworks from the Royal Collection in a stunning setting, which reflects the Palace’s history as a destination for the work of artists such as Holbein, Caravaggio and Gainsborough. The Gallery occupies a newly restored suite of rooms designed by William Kent in the 1730s as private apartments for the Duke of Cumberland. With architects and designers Purcell, Hoare Lea Lighting developed a scheme to illuminate the paintings while minimising impact on the sensitive building fabric. Hoare Lea CGI combined its expertise in the niche area of accurate lighting visualisation with a mastery of 3D-modelling and physically-based rendering tools, such as 3ds Max and Vray, to create photo-realistic visuals. The resulting visualisations (created without the benefit of CAD drawings) accurately represented the final, relit Gallery and proved highly effective in communicating design ideas and showing how the Gallery would look. SBID had the opportunity to speak with Simon Dove, Associate at Hoare Lea & Karam Bhamra, Principal CGI Designer of Hoare Lea. Project Location: Hampton Court Palace, England. The Cumberland Gallery at Hampton Court Palace is a dedicated space for artworks from the Royal Collection. It enables visitors to view the artworks in a stunning gallery setting, which reflects the palace’s history as a destination for the work of artists, such as Holbein, Van Dyck, Rembrandt, Caravaggio, Bassano and Gainsborough. The Gallery occupies a newly restored suite of rooms designed by the architect William Kent in the 1730s, as private apartments for George II’s son, William Augustus, the Duke of Cumberland. The brief given to architects Purcell and the lighting design team at Hoare Lea was to return the Cumberland Suite as closely as possible to Kent’s original scheme. Historic Royal Palaces wanted to create a dedicated space to highlight some of the works of the Royal Collection, and to use Art as the lens through which to understand the royal history, stories and material culture of the Palace. With architects and designers Purcell, Hoare Lea developed a scheme to illuminate the paintings, while minimising impact on the sensitive building fabric. While remaining faithful to the architecture and finishes, the intent was for the environment to have the feel of a gallery, and the lighting immediately announces that this is a different type of space. Picture rails supply power to LED spotlights, which highlight the paintings. Although, Tungsten has often been used in gallery settings, the quality of the white light now produced by LEDs, together with benefits, such as energy efficiency, small size, high-colour rendering of 95+, warm colour temperature, ease of dimming and the lack of ultraviolet light created, made LED an ideal choice. The look of each fitting was carefully considered to ensure the scheme complemented the space during the day, as well as enhancing it at night. These fittings, developed in favour of the traditional linear picture lights usually specified in heritage buildings, give a contemporary elegance to the rooms. Understanding the heritage of the space, while creating a contemporary solution, was crucial. Simon Dove explains, ‘Working within a listed building such as Hampton Court inevitably presented challenges, and mock-ups were used to explore the implications of introducing light fittings and to communicate design ideas.’ For lighting designers, one of the biggest challenges is to communicate the lit impression of their proposed designs, and this is where our use of specialist visualisation came in. Hoare Lea CGI combined its expertise in the niche area of accurate lighting visualisation, with a mastery of 3D-modelling and physically-based rendering tools (such as 3ds Max and Vray) to create photo-realistic visuals. The resulting visualisations accurately represented the final, relit Gallery and proved highly effective in communicating design ideas. In terms of hurdles we faced for the visualisation of the project – there were no existing plans, drawings or models of the Cumberland Suite. A survey was carried out to obtain basic room dimensions, but this did not include any of the bespoke, heavily ornate detailing present in each room. 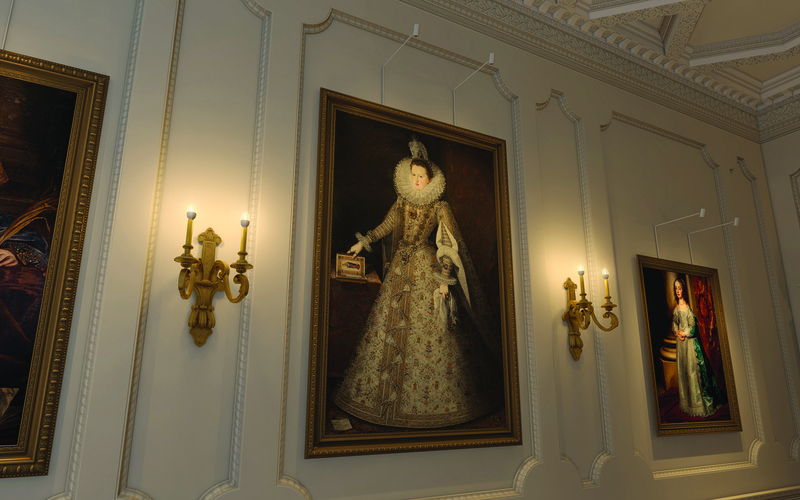 Producing accurate and realistic 3D scenes to give as true a representation as possible of the proposed refurbishment – including new paint, material finishes, furnishings, artworks and of course the lighting scheme – was a challenge. The only option was to build our 3D models from reference photographs, which we took on-site. Every room has a different feature ceiling design and none of it was simple! Making sure we captured and modelled all the necessary detail was a difficult and time-consuming task – but well worth it when you consider the realism of the final result. The Historic Royal Palaces team we worked with know the spaces intimately, so for them to commend the accuracy of our visualisations was very satisfying. The positive feedback Hoare Lea received regarding how valuable the visuals proved in communicating the design proposals was unanimous across the team. We had followed the SBID Awards Visualisation category but had not previously submitted our work. This time we thought we would give it a shot as the Cumberland Suite project seemed very different to the visualisation projects usually entered. We felt its uniqueness and the way the lighting design and visualisation worked together to play such an integral role in the project delivery, deserved recognition. Winning an SBID International Design Award is a real achievement as the Awards are regarded as one of the highest accolades of interior design excellence. Questions answered by Simon Dove, Associate, Hoare Lea & Karam Bhamra, Principal CGI Designer, Hoare Lea.